"My father told me once that words and letters hold all the secrets of the universe. That in their shapes and sounds they held everything, and I could see beyond myself...to something special...perfect. My father told me once that I could reach the ear of God." Bee Season is based on a book of the same name by Myla Goldberg, and her novel is a beautiful deep dive inside a slowly eroding family, but her storytelling seems to defy being proper fodder for the big screen. Goldberg's voice, as author, sails and moves in lyrically simple directions that say more than her characters ever do, and it's the power of that narrative that would seem to make this a difficult story to put to film. That is, unless we're talking about the powers that be in Hollywood, where popular books are always being "adapted," often to the painful mutilation of the author's original work. Here it's semi-dysfunctional family time, only no one seems to know, or more accurately, wants to admit it. The seemingly well-to-do Naumanns seem to have it altogether—that is if you were looking in their a window. 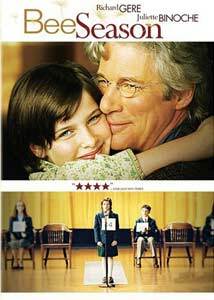 Saul (Richard Gere) is a self-absorbed college professor of religious studies who can blather on at great length about Kabbalic mysticism while making endless dinners that no one seems to really enjoy, and missing what most of us would call "the big picture" of life. Miriam (Juliette Binoche) is the wife who converted to Judaism for her husband and seems Stepford-ishly happy, and yet basically sleepwalks through a life that is haunted by something deeper and darker than anyone realizes. Their teenaged son Aaron (Max Minghella) is at a religious and personal impasse in his life, and a chance meeting with a cute Hare Krishna girl (Kate Bosworth) steers him along a new and different path of self-discovery. All of this percolating dysfunctionality-waiting-to-happen seems accelerated by the youngest Naumann, 10-year-old Eliza (Flora Cross), whose meteoric rise on the regional spelling bee circuit sets in motion a bizarre training regiment by Saul, who convinces her she can reach "the ear of God" via the recitation of some ancient manuscripts. With the spelling bee competitions impelling Saul to drive Eliza to some new spiritual level, the family dynamic unravels further. For the film version of Bee Season, it was up to co-directors David McGehee and David Siegel to once again join forces—as they had on Suture and The Deep End—to try and champion the transformation of Goldberg's book, using a screenplay adaptation from Naomi Foner Gyllenhaal (Losing Isaiah). It's a suitable adaptation of a book that was more content to tell you what characters were thinking and feeling rather than have them spout ready-made dialogue, and the cut-and-tweak needed to reconstruct things into a marketable feature generally works pretty well here. The character of Miriam is still, sadly, a cipher, a vaguely drawn entity that rarely seems more than barely two-dimensional. There are some neat creative visual moments from McGehee and Siegel, with the spelling bee scenes finding Eliza having visions of the words come to her via things like fluttering origami birds or plants that grow out of her body to shape individual letters. Newcomer Flora Cross has a wonderfully expressive face and what seems like a perpetually furrowed brow, and she manages to convey more believable emotion than the seasoned actors she appears with. Cross does a lot with what by comparison is minimal dialogue, which in no way diminishes the strength of her performance. Image Transfer Review: This two-sided disc carries a 2.35:1 anamorphic widescreen transfer on one side, and a full-frame version on the reverse. It's a strong effort here, a very striking set of transfers that are steeped in golds, browns, and greens. Image detail is sharp and very well-defined, with fleshtones appearing natural. Bursts of character-specific color—a recurring theme of sorts that is used quite deliberately throughout—and the transfers render these varying shades accurately. Audio Transfer Review: For what is essentially a talkie drama, the 5.1 Dolby Digital surround track steps up when it needs to for emotional effect. While voice quality is crystal clear and directional movement is very pronounced for things like dog barks and door slams, the stage is spread across the front channels. But it is during those moments when Eliza is in her spelling bee fugue states that score elements rise up from the rear channels to create a swirly sort of soundscape that matches the surreal visuals. Effective and very disarming. A 2.0 Spanish surround dub is also included. Extras Review: Extras consist first and foremost of a pair of audio commentaries, one featuring directors Scott McGehee and David Siegel, and the other has producer Albert Berger and screenwriter Naomi Foner Gyllenhaal. McGehee and Siegel are rather soft-spoken, and their content, such as discussing the discovery of Flora Cross, is kept at a subdued tempo throughout. It seems tough to really excite them, but their presentation is gentle and quite listenable. The second track, with producer Albert Berger and screenwriter Naomi Foner Gyllenhaal, looks at the project from the development perspective, and is equally low key, and the two share insight on the difficult challenge of adapting Myra Goldberg's book, as well as the film's recurrent swashes of symbolism. A couple of space fillers follow, with the dull EPK The Making of Bee Season (05m:30s) offering no insight, consisting largely of Gere chatting about the film amidst clips. The Cutting Room Floor (03m:44s) is a pseudo-blooper reel, with assorted flubs and fluffs delicately pieced together, and set to music. It's not the usual "loud guffaw" kind of gag reel, but it is still rather pointless. Carrying slightly more weight is the refreshingly relevant The Essence of Bee Season(06m:24s), in which assorted brainiacs analyze the film's slant on the nature of, well, being spiritual. It's not a very long piece to discuss such a potentially heavy subject, but consider it a primer to some of the avenues traveled by the screenplay. Lastly, a set of six deleted scenes (06m:25s) are available with timecodes intact, all with optional commentary from Scott McGehee and David Siegel. The clips aren't particularly deep, but hearing the reason why a couple of them in particular were cut was actually more interesting than the scenes themselves. A trio of trailers (including one for the feature) are included. The disc is cut into 24 chapters, with optional subtitles in English, French or Spanish. Here is a beautiful film to look at, full of imaginative sequences that gently intrude on reality as a family begins to disintegrate. At times it's another example of the visual aesthetic coming in ahead of some of the plot's moderately jumbled stumbling blocks that occur during the first third of the film, where certain characters almost become too detached to care about. Things do tighten up nicely, and the good then far exceeds the bad, with a mature-beyond-her-years performance by young Flora Cross, carrying the shifting weight of the film's crumbling Naumann family on her tiny shoulders. I don't expect Bee Season to connect with the mainstream as much as the cover art seems to so desperately want to convey, but it's an intelligent film that tries very hard to march to a different drum.